Tis the season for spending time with friends and family, and for giving. Tis also the season for making, and eating, decedent treats. Sometimes giving and sweet treats go hand-in-hand. To get in the holiday spirit this year at work, we started a "treat club". The rules are pretty simple - we each take turns bringing in new treats. 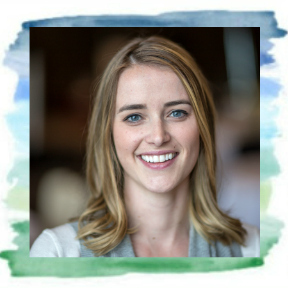 Not only is this a great way to try something new, and maybe even unique, it is also a great way of giving back and thanking my staff for their hard work. The treats have been such a hit, that there's a good chance this tradition will go beyond the holiday season, and no one seems to be complaining about that. 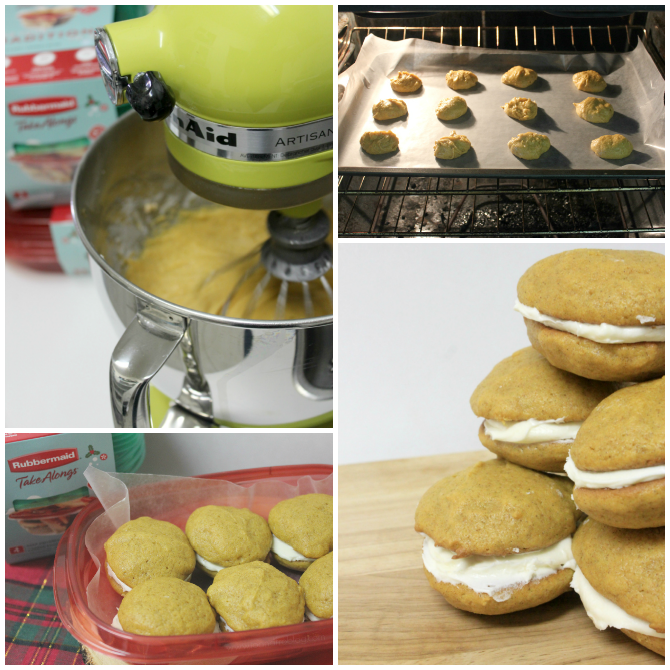 Pumpkin whoopie pies are one of my seasonal favourites. These cake-like cookie sandwiches are soft and light, and packed with the seasonal flavour we all love - pumpkin! Perfect for "treat club". In a medium bowl, stir together flour, baking powder, baking soda, cinnamon and salt. In a large mixer bowl, beat together butter and sugar for about two minutes. Add eggs, beating well. Add milk, pumpkin and vanilla and beat until mixture is smooth. Stir in the flour mixture until combined. Drop heaping teaspoon sized pieces of batter on baking sheets. Bake for 10 to 13 minutes. Remove and let cool completely. For filling, beat cream cheese, butter and vanilla on medium speed until fluffy. Gradually beat in powdered sugar until the mixture is light and fluffy. Once cookies are cooled, spread a heaping teaspoon of the filling onto the flat side of one cookie and top with a second cookie to make the completed whoopie pie. Repeat with remaining cookies. Store in an air tight container, such as Rubbermaid TakeAlongs, in the refrigerator. 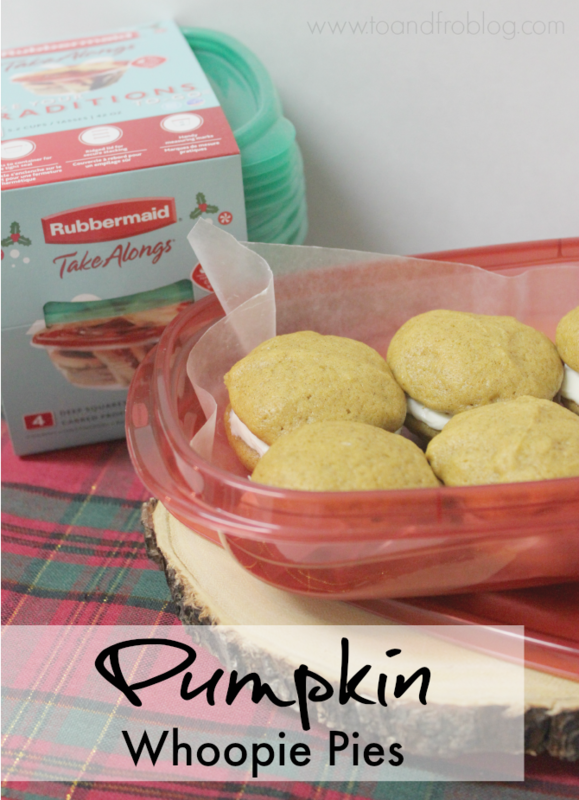 Whether for a work potluck, "treat club", family dinner or even just because, Rubbermaid TakeAlongs ensure that your holiday treats make it to their final destination safe and sound, thanks to the Quik Clik Seal™ technology. 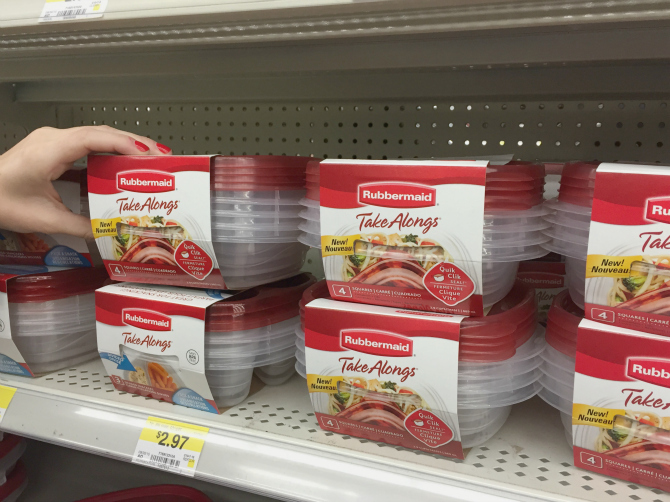 Located in the Home Goods section at your local Walmart, Rubbermaid TakeAlongs come in a variety of convenient sizes and shapes, and are microwave, freezer and dishwasher safe. When gifting your holiday treats, make your Rubbermaid TakeAlongs even more festive with these customizable DIY gift tags. 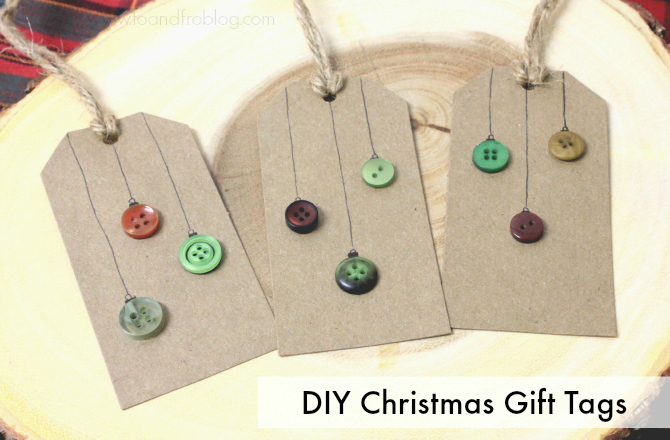 These tags can be made from upcycled items found in your own home, such as old buttons, card stock and string or ribbon. Create the gift tag base by cutting a piece of card stock, scrapbook paper, cardboard or even an old gift tag, into your desired shape. Glue three buttons onto the tag. Buttons can be any shape, size or colour you want. With a black felt tip pen, draw the top of the ornament and string. Customize your gift tag by writing a holiday message to the special someone. Punch a hole in the top of the gift tag. 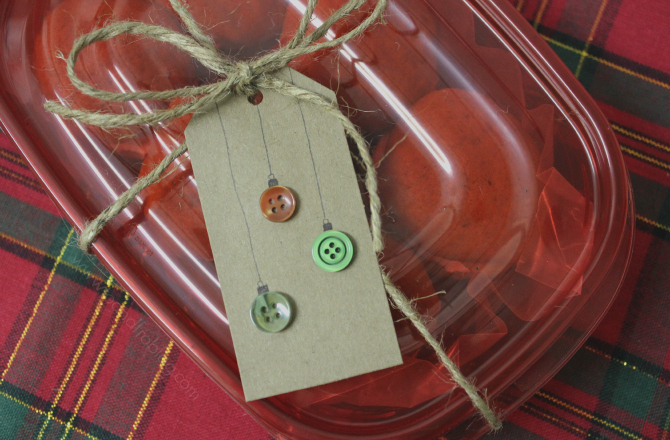 Add a piece of string, ribbon or twine so that you can tie the tag to your gift. 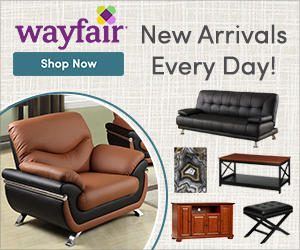 Be creative and have fun with it, the holiday-themed design possibilities are endless! 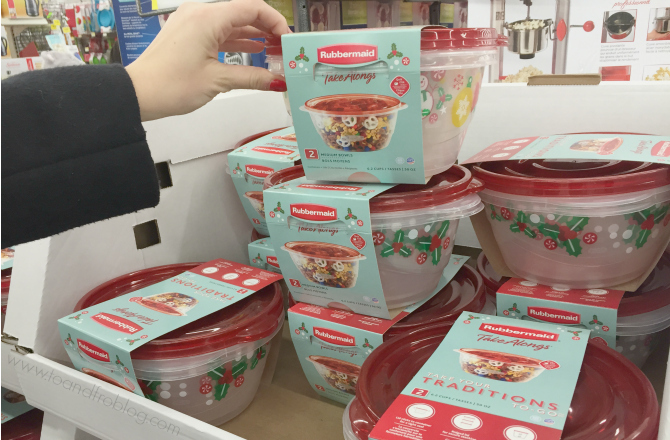 Be sure to check out the iBotta offer - $1 Off of any 2 Rubbermaid TakeAlongs products - exclusive to Walmart shoppers. How will give the gift of thanks this holiday season? What is your favourite treat to share with friends and family?